We have already seen the numbers from 1 to 10 in French. The numbers from 10-20 are a little irregular so unfortunately you will just have to learn them by heart. To write the numbers from 20 to 69 in French, you just add the single number (units) to the tens number. A hyphen is used to join the two numbers together. vingt et un OR vingt-et-un? You may see the numbers ending in 1 after the number 20 (21, 31, 41, etc.) with two different spellings. In 1990 a new spelling rule came into place where all numbers made up of two or more words, including large numbers, now need to be joined with hyphens (dashes). The numbers after 69 follow a different rule that what you may be used to. The rest of the numbers in the 70s follow the same pattern of 60 + a number from 10-19. The rest of the numbers in the 90s follow the same pattern of 80 + a number from 10-19. So in these areas, 73 is septante-trois, 84 is huitante-cinq and 96 is nonante-six etc. Throughout this course we will use the standard French numbers. 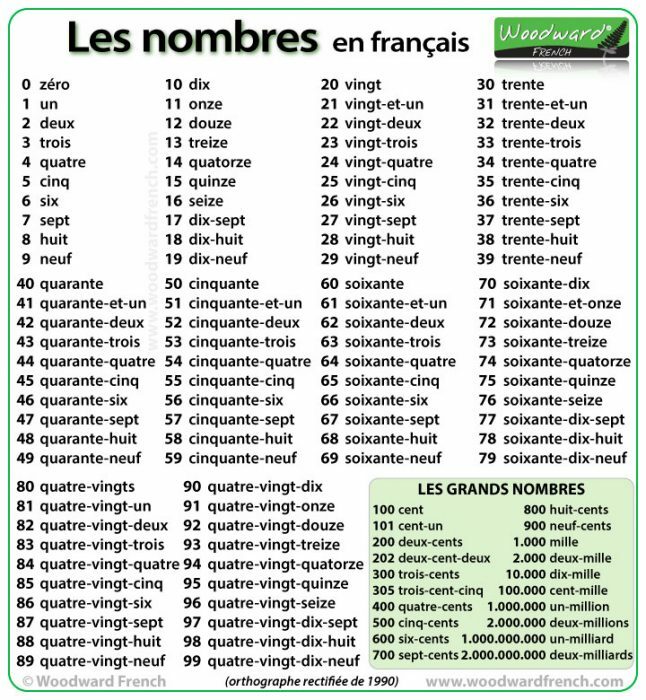 We have a version of this numbers chart for French Teachers.